Synopsis: How do you fix a love that’s been broken beyond repair? Review: I bought the first two books in this series as I saw them on BookOutlet and the covers looked pretty cool. I also saw on YouTube that someone had hauled them recently. I was a little weary at first when I saw that this took part in a drama school. I don’t know what it is but that fact or like musical theatre in books always drives me up the wall because the people always sound so pretentious. But I have to say I like how it was executed. I feel like Bad Romeo and Broken Juliet could have been just one book. The second book was very repetitive. Besides that, I found it to be very addicting to continue reading and I wish there was more. The ending though… is what I think happen, happen? Because that seemed like it was thrown in there out of nowhere and is way too soon if these two are as damaged as they seem. Characters: The tension between Ethan and Cassie was probably what got me through this book. The insecurity between the two really got on my nerves. Cassie’s roommate… Ruby? Was probably the best character, in my opinion. The Plot: As I said above. It’s very, very repetitive of the first book. it definitely could’ve been one book. I can’t tell if this felt realistic or not as well. As I wrote my review I began to realize that this novel wasn’t as good as I once thought it was. Therefore, I am turning my rating of 4 stars to 3 stars. 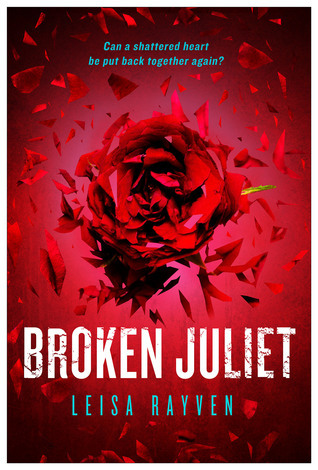 This entry was posted in book review and tagged book review, broken juliet, leisa rayven. Bookmark the permalink.